Today in Masonic History James Benson "Jim" Irwin and Apollo 15 lift off in 1971. 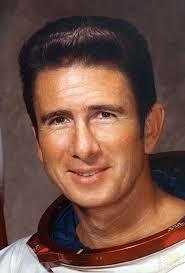 James Benson "Jim" Irwin was an American astronaut. Irwin was born in Pittsburgh, Pennsylvania. He graduated from East High School in Salt Lake City, Utah in 1947. He was then accepted and attended the United States Naval Academy, graduating with a Bachelor of Science in Naval Science in 1951. In 1957 he would graduate with a Master of Science degree in Aeronautical Engineering and Instrumentation Engineering from the University of Michigan. Irwin would attend the United States Air Force Experimental Test Pilot School graduating in 1961. Also in 1961, a pilot Irwin was training crashed the aircraft they were in. Both men survived, although Irwin nearly lost his leg from injuries received during the crash. In 1966, Irwin was one of 19 astronauts selected by NASA. On July 26th 1971, Irwin and the crew of Apollo 15 lifted off for the moon. Irwin was the Lunar Module Pilot for the mission. Apollo 15 was more of a scientific mission than previous missions. Because of the nature of their mission, Irwin and other members of the Apollo 15 mission received geological training to help attain the goals of the mission. On the moon, the astronauts discovered what is called the Genesis Rock. The Genesis Rock is a rock that formed approximately 100 Million years after the formation of the solar system. This would make the rock more than 4 billion years old. On the return to trip form the moon, Irwin developed a heart arrhythmia. It was bad enough for the flight surgeon to state that if he had been on Earth, he would have Irwin in ICU. The spacecraft was pure oxygen and he was being monitored so it was decided that Irwin was essentially in ICU and there was nothing more to do, other than monitor his condition. When Irwin returned to Earth the symptoms seemed to vanish, until two months later he suffered a heart attack. Irwin left NASA and the United States Air Force in 1972, retiring as a Colonel. He would spend the remainder of his life as "Goodwill Ambassador for the Prince of Peace". He would state about his new calling Jesus walking on the earth is more important than man walking on the moon". Irwin would lead several expeditions to Mount Ararat looking for Noah's Ark. On one expedition in 1982, Irwin would have to be carried off Mount Ararat when injured on the climb. In 1991 on August 8th, Irwin while visiting friends went for a bicycle ride. On his return he would suffer another heart attack. Despite his friend who was with him being a doctor and immediately performing CPR, Irwin would pass away. Irwin was a member of Tajon Lodge No. 104 in Colorado Springs, Colorado.